Mr. Campbell has over 19 years’ experience in smart grid and energy storage technology. A Rutgers Mechanical Engineer, he started his career with Ingersoll-Rand Co., holding various positions in Engineering, Product Development, Sales and Marketing. In the late 1990’s he founded Connected Energy Corp (CEC), where he was Chairman and CEO. CEC was one of the first companies to develop hardware and software solutions to network widely distributed energy resources, such as fuel cells, microturbines, biogas generators, solar, wind and combined heat & power systems, through a real-time, Internet based command, control and monitoring platform. CEC was acquired by BPL Global in 2007. In 2010, Mr. Campbell left BPL to join A123 Systems, where he was responsible for building their grid energy storage business. A123’s grid storage business became the industry leader, deploying over 100MW of advanced li-ion systems into grid tied applications worldwide. After A123, he served as the VP, GM of Ultralife’s Battery and Energy Division before taking the role of VP, Business Development for Energy Storage at Schneider Electric. Mr. Campbell then served as the Chief Marketing and Business Development Officer at 24M Technologies, Inc., a developer of an innovative new li-ion battery manufacturing technology. 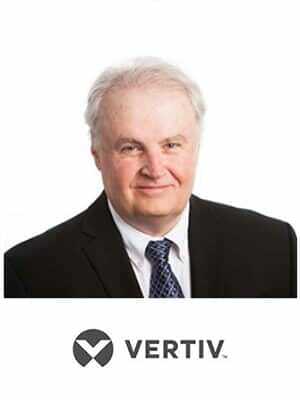 His current position is VP of Business Development for Vertiv’s Critical Energy business. How To Use And Reuse Energy Storage Connected To Uninterruptible Power Supplies For Grid Services?